Sounds like a perfectly great place to start, of course. :-) Yeah, blogs are a different kind of medium. Different things happening, most of them good. 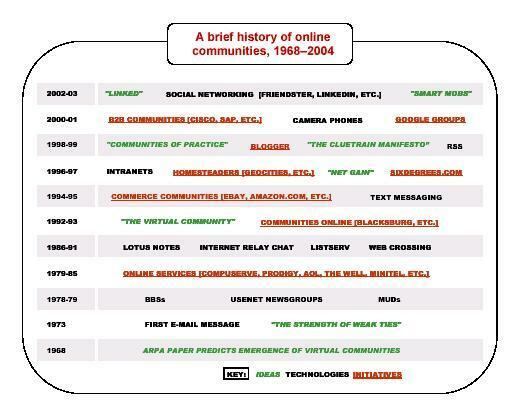 Incidentally, the accompanying text in the report notes that the green items are books, articles, etc, so that "The Virtual Community" refers to the publication date of Rheingold's book, rather than the lifespan of the concept. And, as you suggest, we tried to place items by introduction date, rather than by the date when they became popular. One thing I now wish we'd included: Yahoo Groups. Seems to me it's been significant in a couple of ways -- as a milestone in the self-organizing small-groups trend we talk about in the report, and in its integration of email and web-based discussion. Ah, yes, that explains it. Yeah, Yahoo groups changed a lot of things too. But it is all sort of inter-connected and continuous, of course, so hard to place anything with certainty. Anyway, great chart. 28 Aug 2004 @ 09:32 by Gregory Wright @66.81.179.208 : Famous First Lines: who knows the rest? "Watson, come here, I want you!" "Mary had a little lamb, her fleece was white as snow." " MARCONI'S FIRST [TRANSATLANTIC] RADIO COMMUNICATION "
"That's one small step for the man, one giant leap for mankind!" " FIRST E-MAIL SENT "
-- who can fill in the missing first lines?! Well, the Watson one was Edison. Of course the small step is Neil Armstrong. The first e-mail sent did, I think, just consist of two letters. It was meant to be more, but something crashed along the way. I saw your site and grab in it. Yup, that'll do it. You have my aptiociapren.